Today I have a card for Our Daily Bread Design's Shining the Light challenge. The challenge here was a fun one- use only your favorite ODBD stamps! I love pottery so I knew right away I wanted to use the Pottery (#B121) stamp. 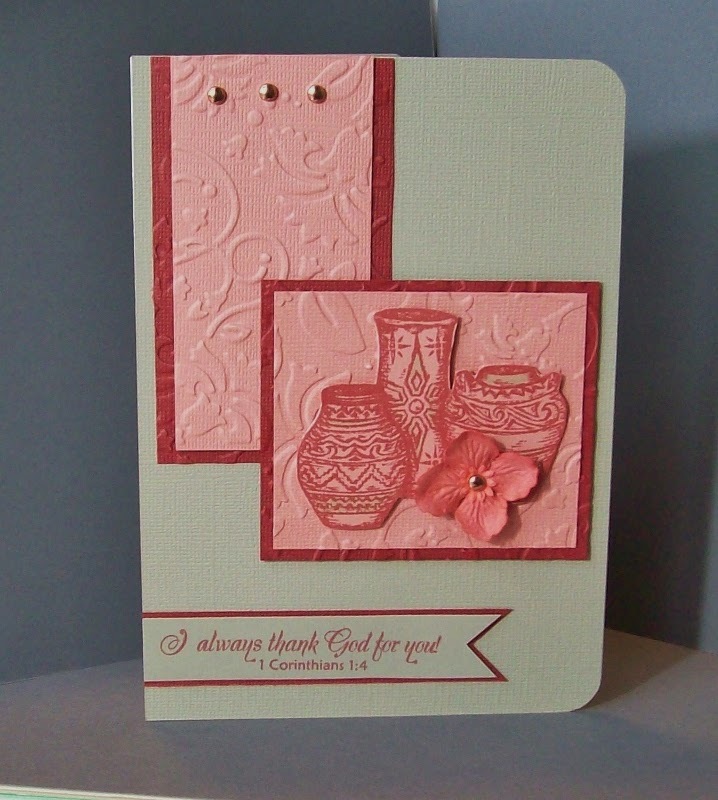 The sentiment stamp is from the Friendship (#B52) stamp collection. I stamped the pottery using ColorBox's Red Barn chalk then fussy-cut the image. Using a very light hand, I colored just a touch on each pot with a marker that matched the card base. I used foam tape to adhere the pots to my textured panel. I used the same chalk to stamp the sentiment. Thanks so much for stopping by today. Hope you have a great day. LOVE: Your color scheme. Your layout. Your layers. The embossing, the stamping and fussy cutting. The little flower. The sentiment. Everything! What a beautiful color scheme and layout Pamela!! I just love the texture you added with the fussy cutting. Thanks for joining us at ODBD this week!! Oh, Pamela, how beautiful! I love your colors and this image, and I especially love this verse as I find joy in remembering people and thanking for God giving me friends...like you! So glad you've joined us again this week for the ODBD Shining the Light challenge! Hugs, sweet friend! Your card is beautiful, as always! I'm too scattered to get things done these days! Crafting with a 4-year-old doesn't accomplish a lot, well, lots of love and lots of mess! With hugz and prayers!